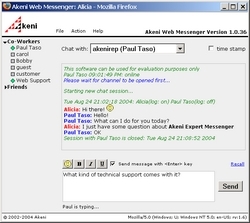 Akeni Help Desk Assistant can be used with Akeni Enterprise Instant Messaging IM. Sales and support staff can interact with customers in real time, without the worry of costly long distance phone calls or the delays of antiquated e-mail systems. Visitors just need to click on the "live help" button to chat without having to install any software. Some of our features are: session transcripts for future reference; team based support that allows one operator to call upon another for assistance or to transfer a session to another operator; canned replies for frequently asked questions; etc. You can implement your corporate instant messaging IM policies and can be used with Akeni Social Networking Software for business.